Campaigners against cutbacks to Dublin Bus services staged a protest outside the group's headquarters in O’Connell Street on Saturday. The protest, co-ordinated by the Save Our Bus Services campaign, is designed to highlight the affects of the cuts in public transport services on the most vulnerable communities in the city. 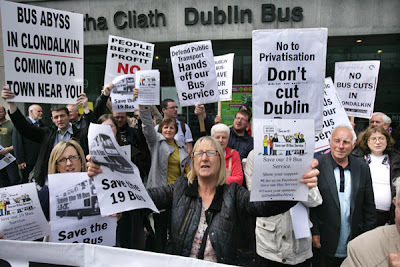 More than 100 people turned out, chanting: "No ifs, no buts, no Dublin Bus cuts." People Before Profit TD Richard Boyd Barrett said people were becoming prisoners in their own homes as a result of the cutbacks. "These attacks are an attack on the old, the less well off and the vulnerable, he said, adding "they're taking out routes that go into estates and to outlying areas...we think this is preparation for privatisation".